In memory of Edgar Froese. RELEASE BY INVISIBLE HANDS/UK. Edgar Froese was the leader of Tangerine Dream, indispensible pioneers of experimental electronic music and space rock who sold more records than any other German band of this genre in history. They recorded more than one hundred studio albums including "Zeit", "Phaedra", "Rubycon", "Ricochet" and "Underwater Sunlight", and a similar number of movie soundtracks including "Risky Business", "Near Dark", "Firestarter", "Thief", "Sorcerer" and "Legend". Founder and leader of the band Edgar Froese passed away in Vienna on January 20, 2015. "Out Of This World" is a compilation put together by his widow, Bianca Froese-Acquaye, and features the music from the band’s later work that meant the most to her. 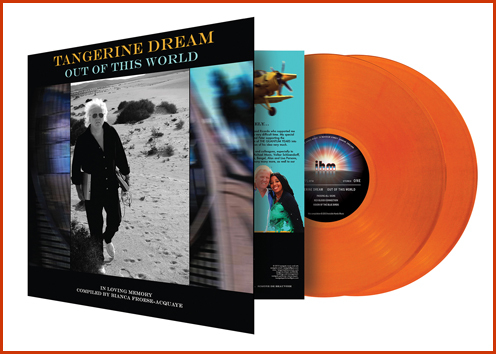 Invisible Hands Music are proud to honour the memory of this titan of music by releasing "Out Of This World" worldwide on special limited edition tangerine coloured double vinyl. SHIPPING START: 21 DEC 2015!! !